It’s the X Factor Philippines live performance week 5! Tonight, the remaining 8 contestants performed their own rendition of OPM songs. Read on for the list of songs plus some insights. Kedebon Colim – “Kailangan Kita” by Gary V.
It’s down to 8 contestants and I still can’t get over the shocking revelation at the results night of week 4 when Modesto Taran was sent home on a TKO with 3 votes from the judges including his own mentor. Ms. Pilita Corales was in fact in the hot seat before the contenders started singing tonight with the X Factor Philippines host KC Concepcion asking her about last week’s results night. Ms. Pilita defended herself and said she wasn’t a mentor but a judge when she sent home Modesto last week. Modesto had at least already made a name for himself and is popular now especially in his home town. 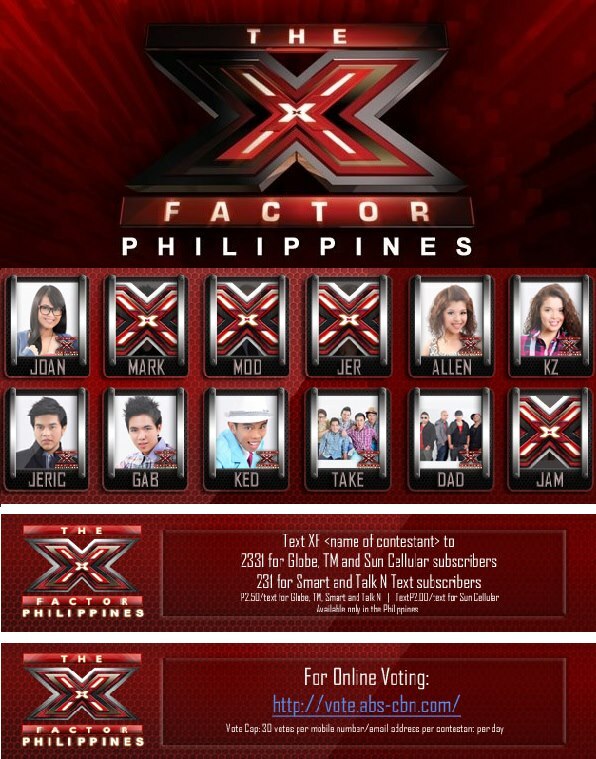 Going back to week 5 of the X Factor Philippines live performance, only Joan remains for the over 25 category. Her version of Nobela is as soothing as Join the Club’s. At some instances, she sounded like Kitchie Nadal. It felt weird that none of the judges, not even Charice Pempengco who is the youngest, knew the song. I was wondering what ancient era they all came from? J Well, at least they said she sounded good and that the song could even be mistaken as her own single because she really owned it tonight. If the previous category only has one act left, the boys still has all 3. All boys did a great job tonight. Actually, all contestants performed well. It wasn’t messed up like the week 3 performance night. Although Kedebon appeared to be trying really hard to hit the notes, he actually pulled it through. Coming from judge Gary V. who sang the original version, he commended Kedebon for performing from the heart. As for Jeric, the judges were right that he doesn’t need to move at all. His smile and voice are enough to make a killing. So it’s a surprise to know that he used to be a heavy drinker and smoker because he doesn’t appear to be one. Lastly, Gabriel did an amazing job with Rainbow even when singing on falsetto. The song is as vocally challenging as Breakeven on week 3 but it probably helped that he liked this South Border song. His confidence echoed throughout the performance. Ms. Pilita said he can actually be the dark horse of this competition. Both acts in the groups category have been in the bottom two. Take Off was in fact in the bottom two twice already. So they should step up their game. Tonight, Take Off’s performance is OK. Daddy’s Home on the other hand showed us something new tonight. Bringing their own kids during their act is heartwarming. Anyway, it matches the theme of their song so it’s perfect. Tomorrow let’s find who goes home. For now, that’s it for the X Factor Philippines live performance week 5.